Ringling College of Art and Design (RCAD) was established in 1931 by circus baron, art collector, and real estate developer John Ringling. The school opened with just 75 students and 111 course offerings. Today, Ringling College of Art and Design serves 1,400 students and offers BFA degrees in eleven disciplines and BA degrees in two. Just a few majors include Computer Animation, Film, Game Art, Motion Design, Visual Studies, and Illustration. Offered through the Illustration Department, the Illustration BFA covers the fundamentals of color theory, composition, anatomy, and digital and traditional media. The school says that “working in 2D and 3D, Illustration students are introduced to and familiarized with professional industry techniques through exercises, demonstrations, guest speakers, critiques, collaborative projects, internships, recruiter workshops, and interactions with real clients in the area.” Sample courses for the program include Computer Illustration, Design and Topography, Figure Drawing, Film and Narrative, Illustration Media, and 3D Design for CA & IL. 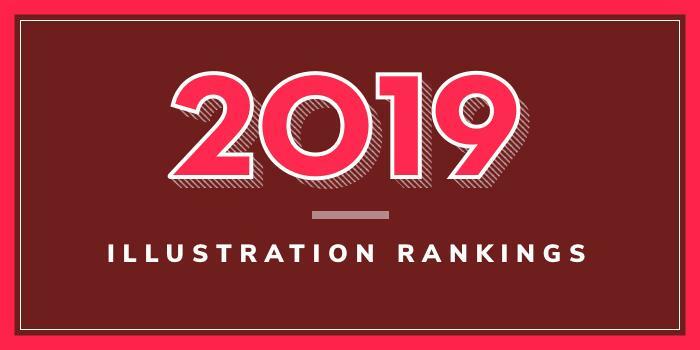 Ringling College students have won more wards in the 40-year history of the Society of Illustrators than any other college, and comprise the highest number of accepted entries into the Society’s annual Student Scholarship Competition. Graduates leave the program with a “comprehensive, cohesive portfolio” that showcases their work and they will be prepared for illustration positions in a range of industries. The school’s most popular programs include Film/Animation/Video, Graphic Design, Industrial Design, Painting, and Illustration. Offered through the Illustration Department, the BFA in Illustration is Rhode Island School of Design’s largest major. The program has approximately 300 undergraduate students “with a diverse range of skills and interests,” says the school. Program highlights include a full roster of visiting artists and art directors, professionals from across the country who offer feedback through annual portfolio reviews, and access to computer resources, printmaking studios, software such as AfterEffects, InDesign and Maya, and the ISB Gallery, which hosts a mix of student or curriculum related exhibitions throughout the academic year. Sample courses for the program include Advanced Painting, Animalia, Cinematic Storytelling, Digital 3D for Illustrators, Dragon Concept & Character Development, In 3-d Mixed Media, Fantasy Painting: The Stuff That Dreams Are Made Of, Style & Substance, Merging Worlds, The Magic of Books, Virtual Reality for Palliative Care, Visible Cities, and Word, Images and Ideas. Students will take workshops such as Maya Basics, Pigments & Emulsions, and Zbrush Sculpting and Illustration as well. Famous Rhode Island School of Design alumni include Seth Macfarlane, creator of Family Guy, Daniel Sousa, animator and director of the Oscar-nominated film Feral, and Lance Wilder, animator for The Simpsons. Other alumni work as entrepreneurs or creative professionals through studios such as Pixar, DreamWorks, and Harmonix, or for networks like Fox, HBO, and PBS. Founded in 1930, ArtCenter College of Design is home to approximately 2,100 students enrolled in 11 undergraduate and seven graduate degree programs in Industrial Design, Visual, and Applied Arts Disciplines. The school, which also offers a joint MS/MBA program with the Drucker-Ito School of Management, has two campuses in Pasadena and satellite studios in Los Angeles (at the Peterson Automotive Museum), and Berlin. Programs for aspiring illustrators include a BFA in Illustration. An Interdisciplinary MFA is also available. Sample courses for the program include Advanced Portraiture, Designing Social Enterprise, Digital Illustration, Experimental Collection Strategies for Surface Design, Illustrative Storytelling, Op Ed Illustration, 3D Motion Graphics, Sequential Design and Visual Development. Graduates of the program have been hired at ArtCenter industry partners such as Apple, Blizzard, DreamWorks, Google, Mattel, Walt Disney and many others. Notable Illustration alumni include Rockstar Mike Shinoda of Linkin Park; Mark “Crash” McCreery Creature Designer/Concept Designer for Batman Returns, Jurassic Park, Pirates of the Caribbean: The Curse of the Black Pearl; Drew Struzan, Movie Poster Illustrator for Harry Potter, Indiana Jones, the Muppets, Star Wars and others; and Phil Hettema, Experiential Designer for The Amazing Adventures of Spider Man, Jurassic Park: The Ride, and Hello Kitty Park. Savannah College of Art and Design (SCAD) was founded in 1978. With campuses in Savannah, Atlanta, Hong Kong, and Lacoste, France, SCAD is home to nearly 13,000 students from nearly 50 states and 115 countries. The school offers more than 40 majors and over 70 minors and certificate programs, including Illustration. Established in 1879, Columbus College of Art and Design (CCAD) is one of the oldest private art and design colleges in the United States. The school is home to more than 1,300 students enrolled in 12 bachelor’s degree and two master’s degree programs covering a broad range of subjects. Programs for aspiring illustrators include a BFA in Illustration with Concentrations in Illustration/Entertainment Design/Drawing; Illustration/Entertainment Design/Modeling; and Illustration/Illustrative Design. An Illustration Minor is available as well as an MFA program. Project proposals for the MFA can be based in Illustration, Painting, Drawing, Animation, Interactive Design and many other areas. Columbus College of Art and Design has also launched a BFA in Comics and Narrative Practice. The curriculum for this program includes nearly a dozen illustration courses. Specific programs for aspiring illustrators are offered through the Communication Arts Department. Offerings include a BFA and a Minor in Illustration. Program highlights include visiting artists, conventions, field trips, and student exhibitions. Students can expect to take foundation courses such as Connections Through Color and Design, Drawing and Building Form, Introduction to Visual Culture, and Ways of Knowing. Sample Illustration courses include Alternative Materials and Procedures for Illustrators, Entrepreneur 101, Illustration Communication Studio, Printmaking, and Typography for Illustrators. Otis College of Art and Design lists the following selected employers Conde Nast Publications, Disney Consumer Products, Hallmark, Interscope Records, Los Angeles Magazine, Mattel, Ogilvy Worldwide, Sony Music, Twentieth Century Fox, WB Network, and Young & Rubicam. Founded in 1907, California College of the Arts (CCA) is home to more than 1,500 undergraduates and 450+ graduate students enrolled 22 undergraduate and 12 graduate degree programs, plus four minors. The school offers a BFA in Illustration and MFA programs in Fine Arts, Comics, and more. A BFA in an Individualized major is also available. Per the school, the BFA in Illustration is taught by “Award-Winning Illustrators” and “digital innovators using the latest technology.” The curriculum is interdisciplinary, which allows students to explore courses outside the program such as Animation, Creative Writing, Fine-Art Painting, Graphic Design, and Printmaking. The program also provides the opportunity for students to develop as entrepreneurs through courses such as Professional Practice, Thesis, and Portfolio. Other sample courses include Illustration Studios 1-3, Illustration Tools: Digital Illustration, Illustration Tools: Painting for Illustrators, Literary & Performing Arts Studies, Media History: History of Illustration, 2D, 3D & 4D, and Visual Studies. Graduates of the Illustration program at California College of the Arts are prepared to seek positions at magazines, for the entertainment industry, and for websites, books, comics, products, packaging, posters, and more. Established in 1885, Kansas City Art Institute (KCAI) has trained students such as Walt Disney (who took Saturday Classes as a child), and multimedia artist Robert Rauschenberg. Today, the school serves more than 700 students, enrolled in 13 art and design programs across several departments. The Department of Illustration houses the school’s BFA in Illustration program. Virginia Commonwealth University (VCU) began as Medical College of Hampden-Sydney in 1838. It later became the Medical College of Virginia and after merging with Richmond Professional Institute in 1968, the school became Virginia Commonwealth University. Today, VCU serves more than 31,000 students from across the U.S. and over 100 countries. The school offers over 200 academic programs through more than a dozen colleges and schools. The Illustration Program is offered through the School of the Arts, Department of Communication Arts. Sample courses for the program include Digital Drawing, Fundamentals of Typography, Illustration: Drawing and Painting, Sequential Imaging, and Visual Studies. The BFA with a Concentration in Scientific and Preparatory Medical Illustration requires 32 credits in the biological sciences and chemistry, in addition to communication major and illustration courses. Sample courses for the program include Business of Communication Arts, Concept Drawing, Drawing Studies: The Figure in Context, Scientific Illustration, Time Studio, and Visual Communications. All communications students have the opportunity to complete an internship and/or study abroad. Founded in 1906, the College for Creative Studies (CCS) is home to more than 1,300 students enrolled in over a dozen degree programs across 14 academic departments. Programs for aspiring illustrators are offered through the Illustration Department. Options include a BFA and a Minor in Illustration. An MFA program is also available. Founded in 1974, Milwaukee Institute of Art and Design (MIAD) is Wisconsin’s only four-year, private college of visual art and design. The school, which serves 630 students, 600 pre-college students, and 250 outreach/special programs students, offers five degree programs and more than a dozen minors. Among the degree programs is a BFA In Illustration that prepares students to work in areas from publishing to web design and as freelancers or entrepreneurs. A 15-credit Minor in Illustration is also available. Per the school, program highlights include the internship and semester-long study abroad opportunities, the opportunity to build a professional portfolio, and networking opportunities through MIAD’s Illustration Seminar, “where a series of workshops are presented by practicing professionals, including MIAD Illustration alumni, representing a cross-section of the field.” Sample courses for the program include Computer Studio, Digital 2D, Figure Drawing for Illustration, Illustration Media, Professional Practice for Illustrators, Systems of Drawing, Typography, and Visual Language. Students in the BFA in Illustration program may complement the degree with studio minor such as Arts Management, Book Arts or Digital Media Production, or a liberal studies minor such as Advertising, Copywriting, or Writing. Communication Design, Industrial Design, and Interior Architecture and Design are other options. Cleveland Institute of Art (CIA) is an independent college of art and design that serves 615 students from around the globe. Established in 1882, the school offers 15 majors in Crafts, Design, Digital Arts, and Fine Arts. Programs for aspiring illustrators include BFA degrees in Illustration and Biomedical Art (Medical Illustration). California State University Long Beach (CSULB) was established in 1949. One of the 23 campuses of the California State University System, CSULB is home to 37,500 students enrolled in more than 300 programs across eight colleges. The College of the Arts, School of Art, offers several programs for aspiring illustrators. Options include a BFA with an Illustration Track, an individualized MA or MFA, and a Certificate in Biomedical Art. Students in the BFA program can take courses from both the Illustration and Animation Tracks and work together in the school’s digital lab, in addition to learning traditional skills. Sample courses for the program include Advanced Illustration, Advanced Life painting, Costumed Figure Drawing, Experimental Animation, Special Studies in Illustration, Storyboarding for Film and Television, and Visual Development. Workshops and presentations are also part of the program as well as courses taught by resident illustration faculty comprised of experienced professional artists currently working in the fields of illustration and animation. The interdisciplinary Certificate in Biomedical Art is sponsored by the Art and Biological Sciences Departments. The program is available to students who are presently enrolled in a degree program in the Biological Sciences or in Art at CSULB. Graduates of the Illustration Programs at CSULB are prepared a professional position as an artist or designer, and for teaching studio art within a selected specialization. Founded in 1958, California State University Northridge (CSUN) serves more than 40,000 students enrolled in more than 140 programs. The school consists of nine colleges, including the Mike Curb College of Arts, Media, and Communication, which houses the Department of Art. Several illustration programs are available through the Department and include BA, MA and MFA degrees in Visual Arts with a Concentration Illustration. Per the school, in the Illustration Concentration, students will study illustration “as both an art form and as a profession. Topics cover “portfolio and website development, goal setting, researching employment opportunities, self-promotion and business and trade practices.” Projects focus on a variety of technical skills in digital media and fine art, self-expression, conceptual problem-solving abilities, composition and design, and the development of a personal artistic vision. Other program highlights include interaction with visiting artists, internship and study abroad opportunities, and the opportunity to exhibit illustrations at various showcases. All Curb College Department of Art students have the opportunity to participate in industry and studio events, organized studio tours, and ongoing collaborative educational partnering with DreamWorks studios and Seoul Institute of the Arts. Students also participate in industry events and internships with Nickelodeon, Disney, Film Roman, Warner Bros., and others. Columbia College was established in 1890 and it serves more than 7,000 undergraduate students and 285 graduate students from nearly every state and more than 60 countries. The school has over 100 academic majors or programs across several schools and more than 20 departments. Schools include the School of Media Arts, the School of Fine and Performing Arts, and the School of Liberal Arts and Sciences. The School of Fine and Performing Arts is home to the Illustration Program, which has both BA and BFA options. The BA is a flexible program allows students to choose a minor or second major. Minor options include Animation, Creative Writing, Game Art, Journalism, Graphic Design, and Motion Graphics. Second major options that complement the degree include Computer Animation, Game Art, Graphic Design, and Traditional Animation. The BFA is requires more advanced courses in illustration than the BFA program, which leaves little time for a minor or a second major. Sample courses for the BA program include Design Lab, Digital Illustration, Figure Drawing, Illustration Studio I, II & III, Illustration: Materials & Techniques, and Survey of Typography. The program also consists of a required internship. Major courses for the BFA include Cartooning, Children's Book Illustration, Commercial Illustration, Drawing the Graphic Novel, History of Political and Social Illustration, Special Issues in Illustration, and Survey of Typography. An internship is part of the program as well as a Portfolio Development course. Because many illustrators work independently, both the BFA and BA programs also emphasize work emphasizes business skills in entrepreneurship and freelance. BA and BFA students typically intern at a design firm, advertising agency, or art gallery and both programs also prepare students for positions in industries such as advertising, book and magazine publishing, entertainment/film, fashion, and product packaging. Established in 1961 as the Laguna Beach School of Art, Laguna College of Art and Design (LCAD) is home to more than 600 students and it offers twelve undergraduate majors and four graduate degrees. Options for aspiring illustrators include a BFA in Graphic Design + Digital Media with an Illustration Emphasis, a BFA in Illustration in Entertainment Design, and an Illustration Minor, which consists of 15 credit hours in courses such as Computer Imaging, Graphic Illustration and Illustrative Painting. The BFA in Graphic Design + Digital Media with an Illustration Emphasis (GD+DM) prepares students for careers in illustration, motion graphics, 3D, package design, user experience and interfaces, advertising, social media, photography and video, and virtual reality. Classes are project-based and include titles such as Communication Design, Design Drawing, Digital Videography, Fundamentals of Illustration, Rendering, and User Interface Design. Students in the program will have the opportunity to complete a professional portfolio and complete real-world projects with industry partners such as Obsidian Entertainment, OC Art Studios, and Xist Publishing. Students in the Illustration in Entertainment Design BFA program will learn how to combine art and technology to create live shows, museum exhibitions, themed events, themed restaurants and parks, TV and film productions, and more. Per the school, the curriculum provides “real-life, hands-on instruction with concept design, model and prop-making, and 3-D digital tools.” Sample courses for the program include Artistic Environment Design for Entertainment, Art of Costume, Fundamentals of Maya, Pictorial Design for Illustration, and Visual Storytelling for Entertainment. Graduates of the Entertainment Design program work at a variety of major companies and studios including Blizzard Entertainment, DreamWorks Animation, Marvel Entertainment, Microsoft Studios, Obsidian Entertainment, Warner Bros., and many others. Pacific Northwest College of Art (PNCA) was founded in 1909. This fine arts and design college offers eleven BFA degrees, seven graduate degrees including MFA and MA degrees, a Minor, a Post-Baccalaureate, and a variety of Community Education programs for adults and youth. Around 550 students from 42 states and 10 countries are enrolled in 21 areas of study from Animated Arts to Video and Sound. Program highlights include mentorship programs, professional practices instruction, portfolio preparation and internship opportunities. Internships for seniors and recent graduates have taken place at companies such as Dark Horse Comics, Microsoft, Nike, Nintendo, and Wieden+Kennedy. PNCA students also have the opportunity to show their work at an annual end-of-year showcase hosted by the Illustration Department at a downtown gallery. Indiana University-Purdue University (IUPUI) was created in 1969 after Indiana University (est. 1891) and Purdue University (est. 1869) merged their many programs and schools. Today, IUPUI serves 28,710 students from 50 states and 142 countries, enrolled in 350 undergraduate, graduate, and professional programs. Seventeen schools grant degrees in Engineering, Health Sciences, Liberal Arts, Life Sciences, and more. The Herron School of Art + Design at Indiana University-Purdue University offers a BFA Drawing + Illustration. The school also offers MFA programs. BFA program highlights include access to the latest equipment and technology in students’ choice of studio spaces, the opportunity to enhance the degree with a Minor in Book Arts or Design Production, and classes taught by faculty who are working professionals in the field. Graduates of the program are prepared to pursue positions such as Animator, Children's book illustrator, Comic Artist or Graphic Novelist, Editorial Illustrator, Packaging Designer, Scientific or Technical Illustrator, Set or Exhibition Designer, Storyboard or Concept Artist, or Toy or Product Designer. Some graduates go on to work as freelance artists or designers, while others start their own businesses. Watkins College of Art (formerly Watkins College of Art, Design & Film) was founded in 1885. The school serves more than 300 students enrolled in BFA degrees in Film, Fine Art, Graphic Design, Illustration, Interior Design, and Photography, a BA in Art, and MFA degrees in Film and in Visual Arts. In the BFA in Illustration program, students will “explore the entire illustration process, including character development, sequential imagery, storyboarding, and visual narration,” says the school. During their junior and senior years, upper-division students will have the opportunity to complete up to two internships. In recent years, Watkins students have gained experience at Advent, Anderson Design Group, The Buntin Group, Prosper Press (San Francisco), Vanderbilt University Creative Services, Warner Brothers Nashville, and others. Founded in 1853, Arcadia University serves 3,850 students enrolled in dozens of degree programs across five colleges and schools. The College of Arts and Sciences houses the Illustration Program, which has several offerings for aspiring illustrators. Options include a BFA in Art with a Studio Concentration in Illustration, a BA in Scientific Illustration with an Optional Emphasis in Premedical Illustration, and a Minor in Scientific Illustration. University of Colorado Denver (CU Denver) originated in 1912 as an extension of the University of Colorado Boulder and gained its independence in 1973. The school serves approximately 19,400 students enrolled in more than 140 degree programs in 13 schools and colleges. The College of Arts & Media houses the Illustration Program, which consists of a BFA in Fine Arts with an Illustration Emphasis and a Minor Illustration. "In preparation for a professional illustration career, the coursework allows students to master numerous essential digital and traditional tools and work to successfully bring the two together in ambitious and innovative illustrative work.” In addition to coursework in a range of areas, students will complete studio courses and lectures, as well as an internship and a Capstone course. Graduates of the program are prepared to pursue a freelance illustration career, as well as positions in advertising, design, entertainment, publishing, and many others. Founded in 1957, California State University Fullerton (CSUF) serves approximately 39,340 students enrolled in 110 degree programs across eight colleges. The College of Arts is home to the Department of Visual Arts, which offers three programs for aspiring illustrators. Options include BFA, MA, and MFA programs in Art with a Concentration in Illustration. The BFA program is designed for students interested in developing skills in a focused area and preparing for graduate study. The Illustration Concentration requires preparation courses such as 3D Computer Animation, Lettering and Typography, and Life Drawing. Major courses include Cartooning and Caricature, Digital Narrative Illustration, Elements of Sequential Art, Special Studies in Illustration, and Visual Development and Background Painting. All students will have the opportunity to complete an internship. Per the school, the MA program “provides a balance of study and practice for those who wish a career in the visual arts, or who want to prepare for further graduate work in the field.” The program consists of nine units of required studio courses, as well as at least 12 units in Illustration. Students may also take an additional three to six units in Illustration or other electives. All students will complete a project to exhibit in one of the Department of Arts graduate galleries. The MFA is a “rigorous” studio program that requires 60 units to graduate. Students in the program must take 24 units in the Studio Area of the Illustration Concentration, at least 12 units of electives, and independent study. A studio project is also part of the program. Graduates of the Illustration programs at CSUF have found employment at major entertainment and publishing companies, such as the Cartoon Network, DreamWorks SKG, Lucas Films Ltd. and Walt Disney Company. Established in 1929, Academy of Art University serves more than 7,200 students enrolled in dozens of Art, Design, Fashion, and Architecture programs. Degrees are offered at both the undergraduate and graduate levels, and many programs are available entirely online. The School of Illustration offers five programs for aspiring illustrators. Options include AA, BFA, MA and MFA degrees in Illustration. A Certificate in Illustration is also available. These degree programs are available entirely online, and some courses for the certificate program are offered online. The AA in Illustration focuses developing skills in the areas of anatomy, figure drawing, rendering, and traditional media including charcoal and paint. The Digital Media component for the program focuses on imagery using both vector and bitmap tools. The BFA program consists of eight semesters of coursework covering the areas such as drawing, composition and color, presentation skills, professional development, tools and techniques, and visual problem solving. Sample courses for the program include Advanced Perspective for Illustration, Analysis of Form, Blogging: Content Creation & Promotion, Editorial Illustration for Apps and Publication, Film & Games, Digital Media 2: Illustrative Imaging, Elements of Digital Painting, Illustration for Consumer Products & Licensing, Interactive and Vector Art, Interactive Illustration, Portfolio Preparation and Self Promotion, Social Media Strategies, and Web Design. Students in the program will also complete an internship, collaborative projects, and a study abroad experience. The MA and MFA programs prepare students for intermediate to advanced positions in a range of industries. They are also prepared for success as entrepreneurs or freelancers. Sample courses include Head Drawing for Illustrators, Perspective for Characters & Environment, Professional Practices for Illustrators, Skill Enhancement: Advanced Digital Painting, Skill Enhancement: Interactive & Vector Art, and The Rendered Figure. Graduate students will attend a Graduate Seminar in Europe, complete a thesis, and participate in a study abroad experience. Students in all programs benefit from guest speakers, workshops, and events that the school says help students “create an insider network” that connects them with industry professionals. They have the opportunity to work with WRiTE BRAiN BOOKS, which has been a partner to Academy of Art University for more than half a decade, and to collaborate with “artists, designers, and innovators outside of the classroom.” Internship opportunities are also available. Graduates of the program are prepared to pursue a career as a children’s book illustrator, comic book artist, concept artist, editorial or advertising illustrator, graphic novelist, interactive illustrator, storyboard artist, and many others. Graduates have been hired by Chronicle Books, Marvel, Random House, The Atlantic, The New York Times, Wired, and many other companies.